Communicating effectively to build connection — Helloo Sunshine! Normally, when we’re upset with someone (including ourselves), we communicate in toxic ways – blaming, passing judgments and making demands. This only results in greater conflict and disconnection, and we stay stuck and unhappy. Last weekend, I attended a workshop on nonviolent communication (NVC), and was so touched by what I learned that I wanted to synthesize and share my learning. And while NVC is a simple, neat framework, it is the underlying principles and attitudes that it encapsulates that resonate with me so much. All the angry, hurt, painful thoughts in your head are your story. Look deeper. What are you feeling? And underneath that, what are you really wanting, missing, longing for? At the heart of the conflict, are your unmet needs. When you get clear on what those needs are, you can own them and empathize with yourself. And then, you can communicate clearly, honestly and empathize with the other. We all have needs and there’s nothing wrong with that. Things go wrong when we start demanding to have our needs met, our way – more on that later. But first, learn the language of needs, so you can wade through all the stories in your head and identify your true needs. So the next time you feel frustrated in an argument with someone, ask yourself: What am I longing for? What am I truly needing? Is it to feel understood? Is it the ability to express myself? Or something else? NVC is about looking at a situation objectively first (what specifically happened) and then understanding your subjective reaction to it (what you felt and needed). And based on that clarity, exploring ways to meet your needs and taking action (making requests). The next step is to communicate what you’ve understood – to express yourself with clarity and honesty, sharing with the other what you feel and need while staying away from blaming, explaining, judging. But effective communication is not just about what you say or saying your bit well. It is about listening deeply to the other as well. It’s taking ownership for both understanding as well as being understood. It is about trying to understand what’s at the heart of the conflict for the other person – what they are feeling and needing – even when they aren’t themselves clear or communicating it well. In fact, by trying to understand them and asking them (Are you feeling _____? Are you needing ____? ), you help them dig deeper to clarify it for themselves. It’s also about how you listen – with curiosity and openness, empathy and non-judgment. You don’t assume you know exactly what they’re feeling and needing, but want to explore with them and are open to being off the mark. Ultimately, it’s a dance between expressing and listening. It helps to start with the latter, because once they feel heard, they will be more willing to hear you. So if you find they aren’t able to listen to you, go back to listening and trying to understand what they need. And then go back to sharing your reality, what you are feeling and needing in the moment. Once you recognize and express your needs, and understand the other’s needs, you can then explore what you can ask of yourself and of others to help meet those needs. The key, is freedom. The freedom to have the needs you have, and to ask for something you want to fulfil those needs. And the freedom you give the other person to consider their own needs, to respond with a yes or no. It’s the assurance you give them that don’t have to do anything they really don’t want to. A request is not a request if you can’t hear a no. Then it’s a demand. A no simply means that the other person has their own needs that are coming in the way. Am I willing to respect their needs? Can I be flexible about how my need is met? What if you can’t find a way to meet your need? Accept when they aren’t met and mourn them. The very least you can do, is have your needs heard, accepted and appreciated, by yourself. It’s therefore about accepting that the way you want to meet your needs may not be possible, because the well-being of both of you matters. It is about staying open and flexible, and persevering: maybe the other cannot agree to what you wanted, but is there another way to address your need that might also work for them? What I find helpful is to consider multiple strategies that may address my needs. And in sharing these with the other, I can offer flexibility and consideration for what works for them. You can express yourself and listen well, but if you’re focused on a specific outcome, communication will break down because the other will sense that you aren’t really understanding them or considering them. So what do you focus on instead? On connection: on understanding and being understood, on finding ways to fulfil needs for both of you. When you’re authentic and are committed to the relationship, the result is connection. And connection is the magic that results in win-win in the long term. When you communicate with an intention of connection, you value your relationship with the person and not just what you want from them. The person on the other side is able to trust you, that you care about their well-being (i.e. needs) and that you’re flexible enough to not demand something unbearable. They feel safe and are able to consider your well-being too, which results in solutions that work for both. Ultimately, it’s being honest, real, and authentic that makes you a great communicator. I walked out of the NVC workshop with a strong sense of commitment to being real and honest. To commit to really understanding what’s going on inside me and owning it. To speak my truth, what I feel and need - without judging or worrying about being judged, without trying to manipulate or make someone believe or do something. To have the courage to live and communicate differently. I realized, it’s not about being nice or pleasing others, its about being true to myself and living with integrity. Irrespective of how others are being, are you willing to do the work of being present, of communicating honestly, of trying to listen and understand their needs, of making them feel heard and staying fully honest, of truly connecting? The language of needs is the most powerful part of the NVC framework. We aren’t used to looking within and understanding our needs. But I guarantee you that when you focus on what you need, rather than focusing on what you ‘want’ (which is a specific outcome, a strategy to meet the need), so much more is possible. 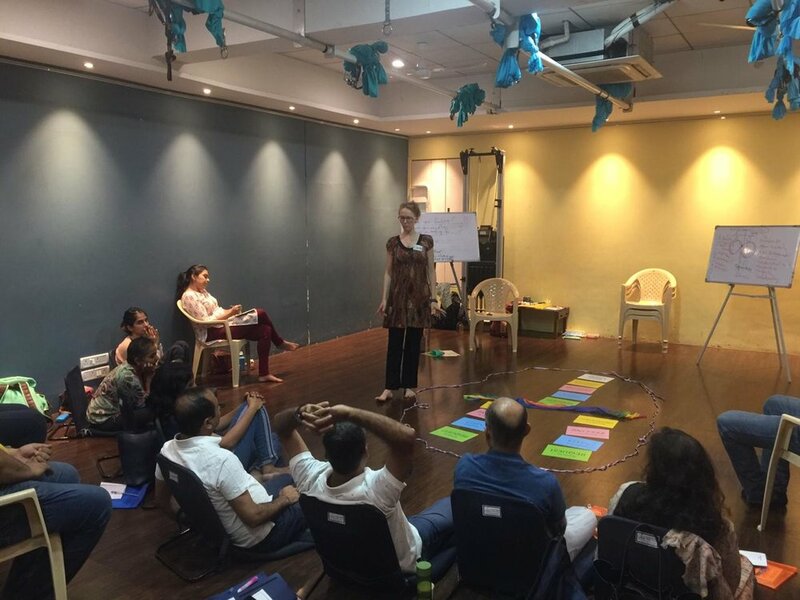 Nonviolent Communication or NVC is a tool developed by Marshall Rosenberg, and has been successfully applied in all contexts – in personal relationships, in organizations, in parenting, in peace-building initiatives across countries, and more. If you’d like to learn more about NVC, there are plenty of books and youtube videos available. I highly recommend attending a workshop though, because the power of this tool comes alive when you have a chance to apply it to your own life and learn from real life examples.